However, from a historical perspective, the task of measuring weight has been somewhat of a troublesome issue, a factor only recently alleviated with the advent of reliable and easy-to-use onboard weighing technology. The latest solutions can display a load’s tare, gross and payload weight with an accuracy of 99% or better. The need for precision in weighing is driven by the demand for accurate pricing of outgoing loads. Likewise, incoming loads can also be verified. And there are more benefits besides. For instance, any risk of overloading is eliminated, thus improving safety. Overloaded vehicles are notoriously more difficult to steer and require additional braking distance. Similarly, under-loading can have a detrimental impact on the bottom line. A further advantage is that data from daily operations can be downloaded to a central PC at the end of each shift. Such information is useful, not just for invoicing, but for management reporting and tracking of customer container weights. And, of course, there’s fewer unnecessary trips to the weighbridge to consider. 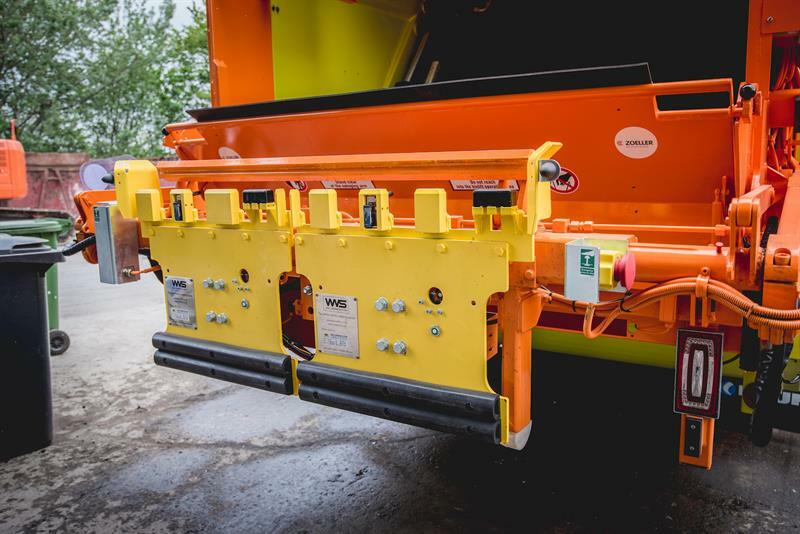 Among the trailblazers in this market segment is Refuse Vehicle Solutions (RVS), which has teamed up with Vehicle Weighing Solutions (VWS) to offer customers onboard bin-weighing systems, which can now be fitted to all makes of new ‘in-build’ vehicles or retrofitted to existing trucks. The Enviroweigh bin-weighing system from VWS is the only weights and measures approved system in the UK, making it suitable for pay-for-weight services. So, which waste management companies are taking up onboard weighing technology? Well, among the latest converts is Leicestershire-based AE Burgess & Sons, which has enhanced its commercial waste services with the purchase of a new refuse vehicle. The company, which provides a range of services including skip hire, recycling, scrap metal, and commercial and hazardous waste management, has purchased a 26-tonne Mercedes Econic Dennis Olympus refuse vehicle from RVS. Importantly, the truck is equipped with the latest bin-weighing and safety technology, including a camera recording system. Elsewhere, a new refuse truck has been delivered to Crawfords of Beith, to expand its commercial collection rounds in Inverness as part of the company’s ongoing contract for Munros, the largest recycling company in the Scottish Highlands. The 8x4 DAF CF, with Incomol Pusher 4000, fitted with skip arms and trade bin lift, was again supplied by RVS. Remaining in Scotland, an onboard weighing system from Avery Weigh-Tronix is ensuring that Dundee City Council can maximise its refuse vehicle loads but stay within legal weight limits. Using the new system, the driver can check the vehicle’s gross and net weight, and load distribution, across the axles. This information is viewed on an easy-to-use display unit and can be downloaded to a PC or printed as a permanent record. With the Dundee City Council system, once the maximum plated weight has been reached, no more waste can be loaded due to packer cut-out functionality. Just a few miles west, at Perth, two companies have come together to offer a fully integrated collection and treatment solution. Food Waste Scotland is the collaboration of waste management and recycling company Binn Group, and food waste processor Earnside Energy. Operating side-by-side at Binn EcoPark, the companies have begun collecting and recycling up to 30,000 tonnes of food waste each year, generating around 18 million kWh of electricity for the national grid. In preparation for the partnership, Binn Group invested in a fleet of new food-waste collection vehicles with onboard weighing capability in late 2017. The Food Waste Scotland initiative is designed to reach out across the nation, offering any business producing waste food a cost-effective and compliant solution. Since 2016 it has been a legal requirement in Scotland for all businesses generating more than 5kg of waste food to segregate this from other waste streams and ensure it is collected separately. The new partnership also points out that even if the government achieved its target figures, there would still be an estimated one million tonnes of food waste in Scotland requiring proper collection and treatment. Clearly, weighing technology has a pivotal role to play in the accurate and efficient collection and processing of this waste. Here, MacGregor emphasises the need for everyone to segregate food waste in order to avoid contaminating other waste streams, rendering them non-recyclable.